Once we’ve learned how to swim, some of us always want to go further, a little bit more every time. The idea of moving from one place to another excites us. The sense of achievement from point A to point B can be exhilarating even. Just swimming can be tiring and takes immense training to achieve. 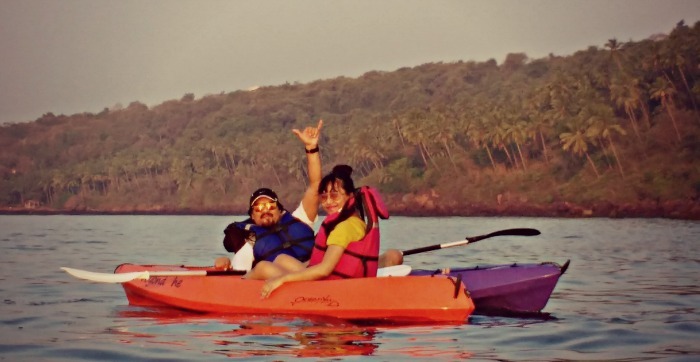 Kayaking on the other hand is easy to learn and easy to master with sufficient practice. Kayaks are available for all occasions, locations and conditions thus making it a versatile sport. To start with sit-on-top kayaks are the best, as the name suggests you sit on top of your kayak. They are usually shorter and broader, making them perfect for recreation or to get you a little further into the sea or lake. When you try Kayaking for the first time you don’t want to feel trapped in, sit-on-tops avoid just that, they’re easy to climb in and out of, fall from yet are still safe for beginners. Paddling is a great way to exercise your core; it’s the part of our body that is often neglected. The core supports the torso and every small or big movement relies on its muscles. Paddling or kayaking correctly gives the core a great workout without you realizing it. Off course you will still having fun paddling around and exploring the open blue. With a loved one, with yourself or just nature all over again. Double seated kayaks are available in Sit-on-Tops and in semi seat in styled kayaks. You could paddle out in doubles or a just a couple single seat kayaks. Enjoy a sunset together or a session of fishing by the lake. Teach your kids how to paddle or try catching small surf. Be it you and your partner, family and friends or just you out with nature you can’t just help but feel refreshed and full of life, you can’t help but fall in love all over again. All you need to do is just take the time and give it a go or should I say row? Whatever the reason may be, as long as it’s Kayaking that set’s you free.